Summer is the season for swimming holes, shady groves, and a blanket in the grass with a cold drink in hand. It's also the time to pack the car and hit the open road. And what better place to do so than the adventure-filled mecca of the American Southwest? Linking the region's top outdoor destinations in one trip may seem overwhelming, but with proper planning and some drive-time stamina, you can create a jam-packed summer road trip full of swimming holes, waterfalls, canyon grottos, and mountain vistas. Beginning in St. George and ending in Telluride, here's how to make the most of a weeklong road trip that travels from the sand to the snow across Southern Utah and Colorado. To maximize coverage along this route, our trip begins from the west along I-15. St. George is a good launch point, and the biggest city anywhere on the trip, so take the time to stock up on all the supplies you may need. Then get outside. First, head north and aim for the tiny town of Toquerville, where a bumpy dirt road and short hike lead to a hidden oasis, Toquerville Falls—tall cascades that tumble into freefall and empty into a perfect swimming hole. There is also free dispersed camping on BLM land near the trailhead. If you can wrench yourself from this paradise, it’s time to continue on I-15 to Zion National Park—but not the people-jammed part of the park that first comes to mind. Rather, this route takes us to Kolob Canyons, which is separate from the crowded south and east entrances. Here, traffic is much lighter, but it’s still loaded with scenery and plenty of options to choose your own adventure. A quick stroll to the vista at Timber Creek Overlook, rewarding day hikes in Taylor Creek, wilderness backpacking among canyons and arches of La Verkin Creek, rappelling a slot canyon waterfall in Beartrap Canyon, or simply staying in your car for the scenic drive are just a few to choose from. After leaving the park, continue north and top off this region of Utah with an exploration of Kanarraville Falls, a shady creek hike into a narrow slot canyon with one of the most photogenic little waterfalls you’ll ever find. Paid camping is available in Kanarraville, or you can find free BLM land on a lake along Kolob Terrace Road, east of the national park if you venture out there. Forging on from this area, the route soon leaves the interstate and climbs in elevation on UT-14 toward Bryce Canyon National Park—the famous natural playland of rock spires, arches, and hoodoos. For a quick tour through the heart of the park, join in on the popular Navajo Loop Trail and Queen’s Garden Trail. Drive to the amazing views at Bryce Point or Rainbow Point, or hike in between them and dip below the crowds on the backcountry Under-The-Rim Trail. Now two or three days into our trip, this is a good time to get solid sleep. Free dispersed camping is abundant in Dixie National Forest near Bryce. For more amenities, you can stay inside the national park or at one of two nearby Forest Service campgrounds with lakeside real estate in the shady, high-elevation pine forest. King Creek Campground and Pine Lake Campground are both on reservoirs perfect for swimming and paddling in the heat of summer, and are within a short drive of the Bryce Canyon entrance. Wake up early and greet the day from Bryce’s Sunrise Point, then hit the road on the the ultra-scenic drive toward Grand Staircase-Escalante National Monument. This area is absolutely stacked with adventures, and offers two distinct regions to explore: one for mountain lovers and one for desert dwellers. Both are equally incredible, but in a week-long road trip you may have to choose one or the other. Either way, stop in the town of Escalante and fuel up at the historic and tasty Nemo’s diner, take stock of your surroundings, then make your choice. The desert option takes you down Hole-In-The-Rock Road and accesses a hidden labyrinth of sandstone creations. For short day hikes, check out the eerily weathered formations of Devil’s Garden, the claustrophobic slots of Peek-a-boo and Spooky Gulch, or the wild pink and purple-striped walls of Zebra Canyon. A long day hike gets you into the sky-lit amphitheater of Golden Cathedral in Neon Canyon. Dispersed camping is free nearly anywhere out here, but backcountry treks are also there to beckon you away from the road. You can seek out hidden arches, slots, and swimming holes with an overnight journey into Coyote Gulch and the Escalante River Canyon. After getting your fill of desert fun, shake the sand out of your shoes, then hop on Highway 12 toward Boulder and enjoy eyefuls of canyon country the whole way. Make a stop to rinse off at Calf Creek Falls, a stunning waterfall and refreshing swimming hole. The mountain alternative follows the thrilling Hell’s Backbone Scenic Byway, which climbs into deep conifer forest, aspen stands, and alpine meadows in the high country above Escalante. It borders the Box Death Hollow Wilderness, which offers little-known day and overnight hikes into The Box and tributary side canyons. You can spend the night at one of three developed campgrounds along the road, or find a spur road and a quiet dispersed camping spot somewhere all to yourself. Pull over for pictures at the wildly exposed Hell’s Backbone Bridge, then descend the second half of the road toward Boulder, Utah where a delicious meal awaits at the Hell’s Backbone Grill. The next stop is the third national park on our list, Capitol Reef. There is lots to do here, but a flash tour should at least include a jaunt up to Rim Overlook, which grants huge views of the wildly furrowed landscape. Climbing farther up this trail to Navajo Knobs ditches some of the crowds and reaches even better, 360-degree views among craggy rock spires. Continuing the drive across canyon country puts us in Arches National Park, which is worth stopping into if only for an hour or two. The park road gets up close to several of the best arches and towers without having to leave the car, but there are plenty of excellent hikes if you have the time. Discover hidden formations in the Devil’s Garden area, or forge your own trail and camp in the backcountry of the Fiery Furnace. After Arches, head into the town of Moab and grab a bite to eat at Milt’s Stop & Eat diner, which is near the next destination, the crisp swimming holes and waterfalls of Mill Creek Canyon. Take a quick dip below the waterfall at the end of Powerhouse Lane, or hike a mile up the canyon to a more secluded pool and falls, and zero crowds if you venture farther past the main area. 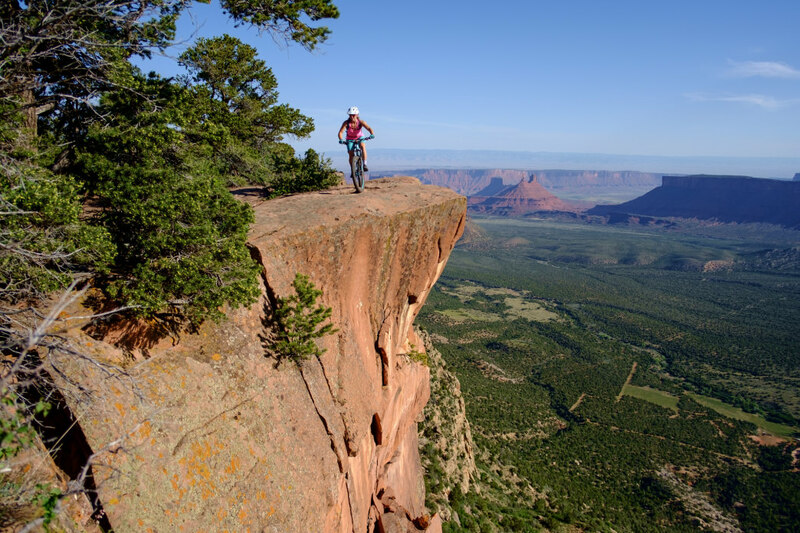 If you have your mountain bike, be sure to catch at least one morning ride on the world-famous Slickrock Trail on undulating sandstone in Sand Flats Recreation. You can spend a night for cheap here in Sand Flats, or in a campground along Highway 128 east of town. Free options are along BLM roads off 128 or US-191 north of Arches. Though it’s a bit longer, the more adventurous route to Telluride continues south from Moab, past the snow-capped La Sal Mountains, and east to Colorado via the town of Dolores, where you can swim or paddle in the lake at McPhee Recreation Area, and spend the night in the Forest Service campground. The San Juan mountains are now within reach, and the road from Dolores climbs toward the crest of them, crossing at Lizard Head Pass. This is the high-elevation gateway to Lizard Head Wilderness, where you can hike among alpine lakes and brilliant wildflowers in the shadow of 14,000-foot peaks. Take a short stroll on Lizard Head Trail or continue on longer hikes with prime views by connecting Cross Mountain Trail to an idyllic lake in Navajo Basin, or Wilson Mesa Trail to thundering waterfalls in Bilk Basin. Camp along a trail in the wilderness, for free near the road at Priest Lake dispersed camping area, or for a fee in Matterhorn Campground. Just beyond this wilderness is our final destination of Telluride, but one more hidden gem is worth a stop along the way. Take a side trip down a dirt road in the tiny town of Ames, then a bumpy spur road to Lake Fork. Hike up this creek to find the picture-perfect Upper Ames Falls, or Mystic Falls as they are locally known. 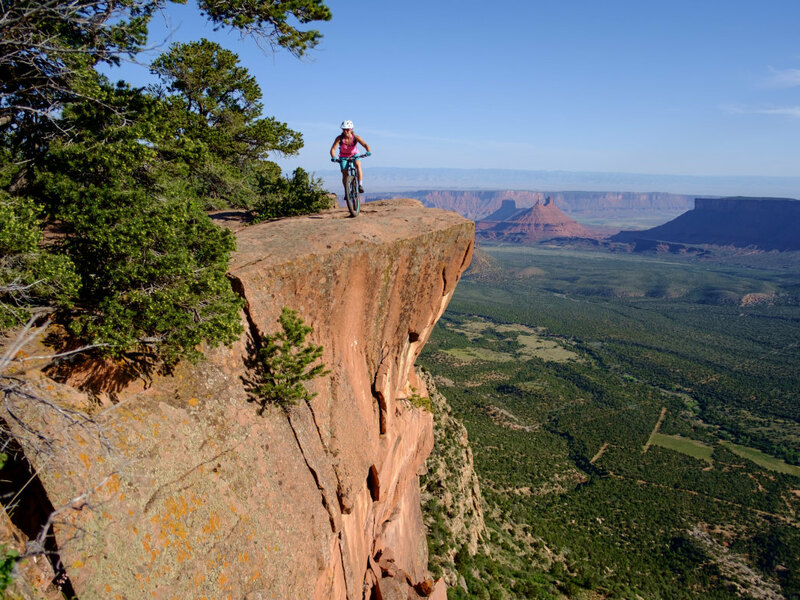 Linger here in the spray for as long as you like, then waste no more time driving the last few miles to Telluride, the apex destination of your action-packed itinerary across Southern Utah and Colorado. A top ski resort town in the winter and a magnet for mountain getaways in summer, Telluride features all the warm-weather ideals. As the snow retreats to the highest peaks, wildflowers spring up, aspens leaf out, waterfalls pour down, and the natural exuberance is matched by music, beer, wine, and holiday festivals in town.